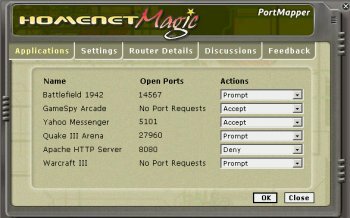 Port Mapper is a freeware tool which helps home users open/close ports in their routers and gateways securely. It automatically maps and manages ports in the router, enabling online multiplayer game play without disturbing the gaming session. Port Mapper is more secure than manually opening and closing ports, because it opens the ports only when needed and automatically closes them when you are finished playing. Port Mapper works with your Internet gateway/router in such a way that you can have control on the programs that communicate over your network. Using Port Mapper, you can expose applications to your friends over the internet in a safe manner. It also supports wireless connectivity and notifies you when you go out of range of the gateway.